1. Download 7zip or zip version of XAMPP and extract it in a folder OR Download setup and install it. 4. Start the “setup_xampp.bat” and beginning the installation. 5. Double click on xampp_start.exe. It will start XAMPP. Note: Do NOT close console window if it is not closed automatically. Keep it opened. 6. Start your browser and type http://127.0.0.1:8080 or http://localhost:8080 in the location bar. You will see XAMPP start page. Now, you can work with both IIS and Apache servers. Type Inetmgr and Open Internet Information Services (IIS) Manager. In the Action pane, click Bindings. 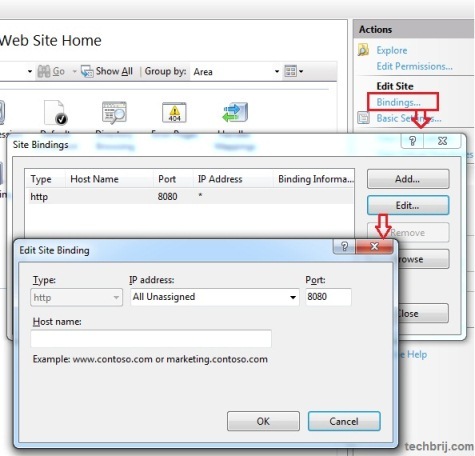 Click Add to add a new site binding, or click Edit to change an existing binding. Now http://localhost:8080 is for Default IIS website. Now which case is suitable for you? If you have high priority IIS website(don’t want to change) or have many existing sites running in IIS, change XAMPP port else change IIS default website port.